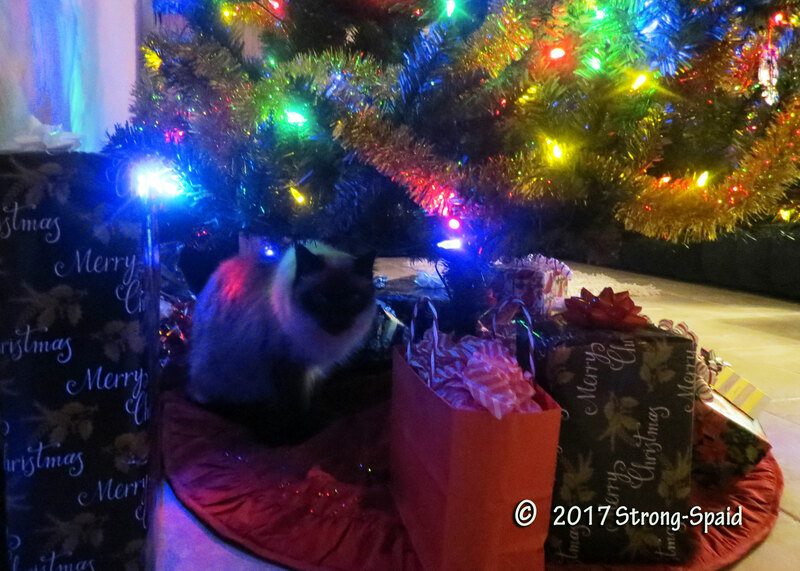 It was the night before Christmas, and the area directly beneath the sparkling tree was under close surveillance by our two stealthy cats. I could tell by the stern looks on their faces that they were not going to let anything cross into their protected zone—except for humans with prior approval. I can’t explain why they suddenly decided this area needed to be guarded, but there must have been some good cat reason. Perhaps they had seen a wayward spider? Apparently the male cat Keona decided to volunteer for the Christmas eve night patrol shift, because he gave his assistant Siri permission to retire to the adjacent bedroom. 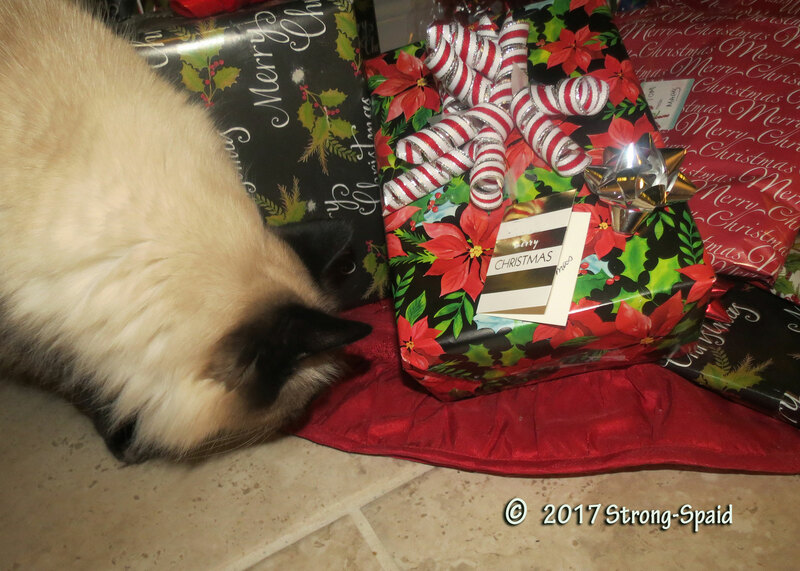 As soon as she left, he began sniffing around the tree, doing one last check to assure that there were no unwanted creatures attempting to crawl into the paper or under the tree skirt. After he thoroughly sniffed everything twice and was positive that all was safe and secure, he quietly returned to his secret hiding place at the back of the tree beneath the branches (where he thought he could not be seen). And there he stood a lonely vigil while time ticked slowly by. Keona had hoped that he was going to be able to defend the Christmas gifts and prove his catly worth, but absolutely nothing was happening. Eventually, in spite of his incredible patience, he had to admit to himself that he was getting tired. With his mouth still wide open in a big cat yawn, he wondered why he had ever decided to take this pointless night patrol job. It certainly wasn’t as exciting as he thought it would be. Feeling rather dejected, he decided there was no purpose in continuing to stand any longer and he sat down. As soon as he started to relax, he began to realize that he had been focusing on all of the wrong things. There was no danger around him, only beautiful dancing lights coloring him with a warm glow. Because he had only been searching for the negative, he had completely failed to notice the positive. Christmas revelation! He decided to immediately retire from his job as Christmas cat on night patrol–and curled up into sleep until a gentle ray of morning sunlight shone through the kitchen window. 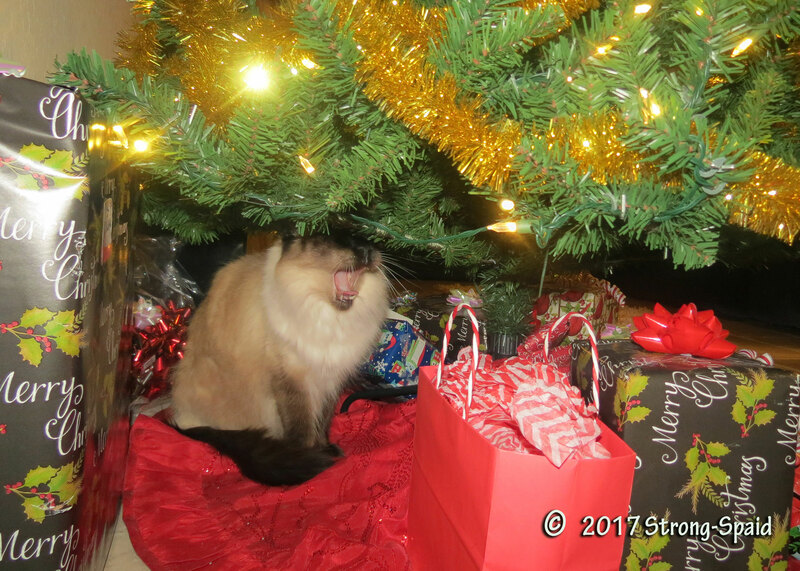 This entry was posted in Animals, Pets, Photo Essay, photography and tagged cats, Christmas, Jobs, presents. Bookmark the permalink. That’s such a nice story. It’s a new place for them to investigate, and hide. Hiding and stalking–they do love to do that. Because I have 2 cats, one is always trying to surprise the other–jumping out from behind furniture, hoping to catch the other one off-guard. Have to satisfy the ‘wild cat’ within! Thank you…and Merry Christmas to you and yours. Christmas trees and cats are a dynamic combination!! May we be as curious and playful as your two cats!! Yes! 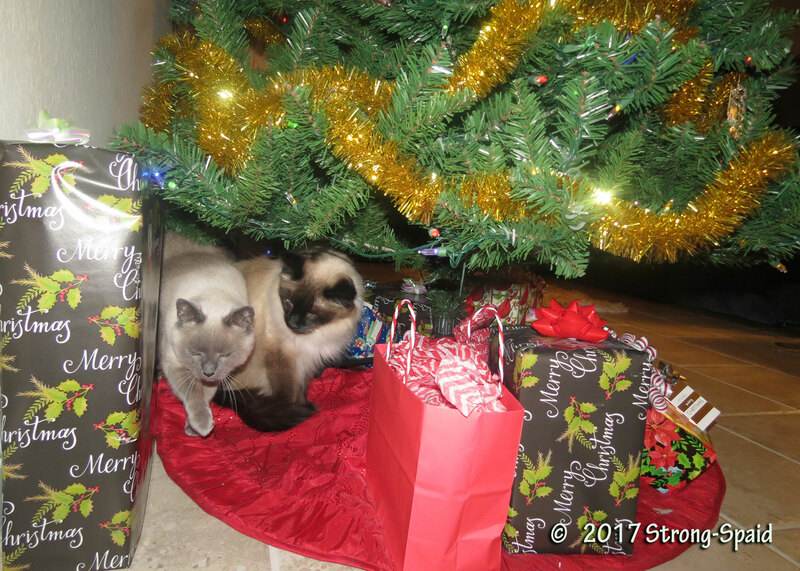 When we first placed the red tree skirt under the tree, before the presents were there weighing it down, they were using the skirt to go on “magic carpet rides.” They would come running into the room at full speed, jump on the skirt, and then the cats and skirt would go sliding across the tile floor at high speed. Great fun. We kept putting it under the tree and they kept sliding it back out across the room. Quite a good game, it was. Love your Christmas cat story. 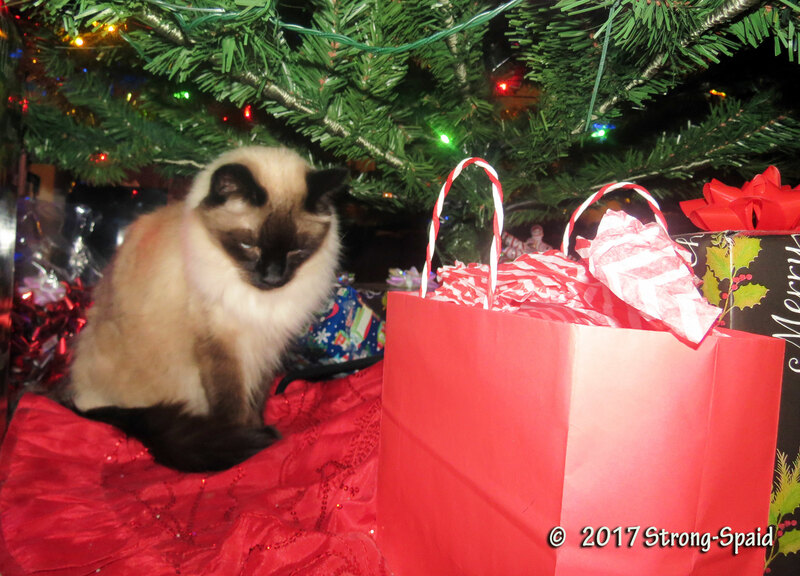 One of my cats (Patches) loved to lay under the Christmas tree on the skirt. I don’t know if she liked the heat and glow of the lights or if she thought it was her special hiding place. Aaah….I was wondering who this was!! I think cats like feeling protected by the tree branches overhead. Plus the beautiful lights flashing on and off are fascinating to watch. He tried to bite one of the lights once. Not good! That’s a cute name for a cat. My daughter’s 7 year old son named their adopted cat “Meow Meow”…because that is what the cat always said when she saw him coming. 🙂 He loved that cat so much. Now he is 9 and his beloved cat is gone–just disappeared one day. Pretty sure it was the work of a coyote. Life is so sad sometimes. A few ago, when we had two male kitties–the smaller gray one, pursued by the older meaner tabby, grabbed the garland, spun the tree around a couple of revolutions. I guess the plan was to spin off his pursuer. They don’t seem to be that interested in catnip. They go crazy over Ben Gay and Vick’s Vapor Rub. I think it’s the menthol. Wishing you a great New Year too! Spending this wonderful New Year’s day inside. It’s still one degree below freezing out there. Such a stunning story Mary! AND oh…here is another. He really is a gentle cat, but that look in his eyes! But really, don’t let those ‘looks’ fool you…..he is the gentlest, kindest (most photogenic) cat that I have ever had. LOL I just looked at your links. You could so reply to anyone’s email or post with JUST his expression of the day!!! He has that ” do not even think about it” look in one and the other is ” Do I like you or do I not, you will never know but I’ve got your number” i think i could come up with caption after caption. So expressive. Ours would tear around the house every single night at midnight. Her name was sam. She would run around jump on things. We had this living room with high rafters and she would somehow climb up there. Climbed the christmas tree every year. Slept in bed with me every night. She more howled than meowed. Was very talkative. Your is just so photogenic!!!!!! Ours lived to 21!!! I got her when I was 13. My daughter got to meet her which was pretty neat. My first Siamese was named Samantha (we called her Sam too). She was a real sweetheart. She died when she was 15 years old. About 9 months after Anika died, we brought home a new little female cat (Siri) from the Siamese Rescue Center. Keona likes Siri and they get along well–BUT looking at the photos, it is obvious to me that Anika was the love of his life and that will never change. Ours was Samantha 😭😭😂 too and we called her sam. Funny thing when i married my husband his grandfather had a siamese named sam too! Im so sorry you lost his sister . I probably can’t read it because i am still very very fragile over the death of my service dog jess. It was a year ago but i had 5 grand mal seizures which caused some memory loss and i keep forgetting he is gone. I can just imagine our cat doing much the same thing. Great photos Mary. Never have to buy cat toys…rubber bands, paper boxes, old lids from milk containers, and on and on…..everything is a wondrous toy. We can learn so much from our cats! Wishing you the very best in this new year too.Thanks for the hug, Eddie ! Thank you…Joy to the World!! They think they are beautiful, that’s for sure!